Among the smallest countries in Africa, Togo's name is derived from the Ewe people words "to" water and "go" shore to give the sense of "by the water". 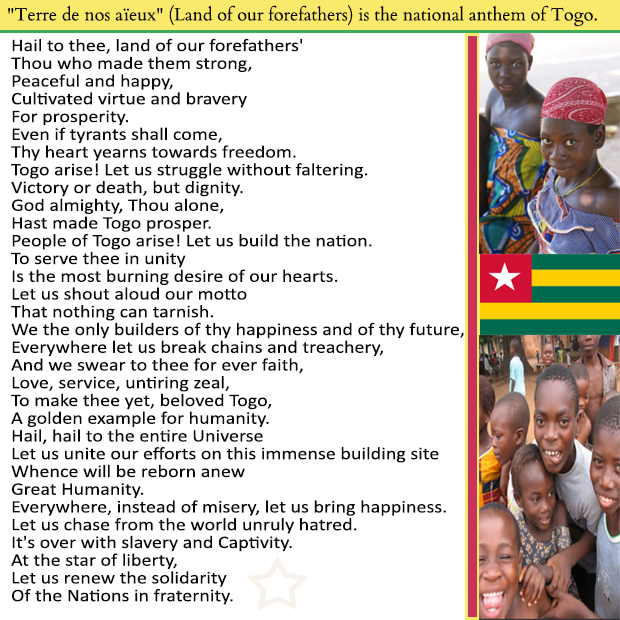 Togo's National anthem, adopted 1960, restored 1992 is "Salut a toi, pays de nos aieux" Hail to Thee, Land of Our Forefathers. Lomé is the capital and largest city of Togo. 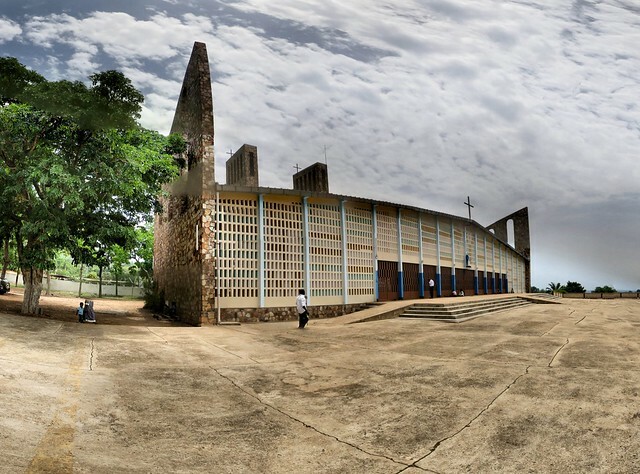 One of the largest buildings of Togo is the Cathedral of Our Lady of the Trinity, the parish of Atakpame. Beautiful mother and child in Lome Togo. Togo has 37 African tribes; the largest are Ewe, Mina, and Kabre. The town of Aného Togo was as a slave port. Weighing cotton at the cotton market in Togo. Cotton is one of Togo's main cash crops. 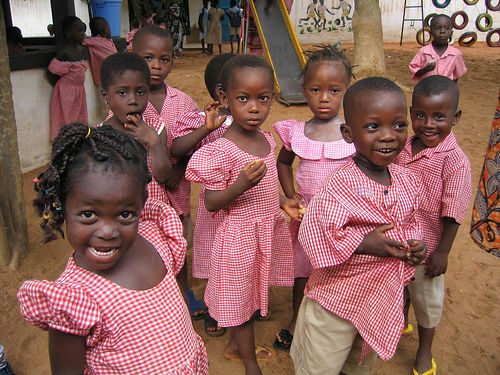 Elementary school children in Togo Africa playing games and eating snacks. From its 32-mile (51-km) coastline on the Gulf of Guinea, Togo extends northward for about 320 miles (515 km) between Ghana to the west and Benin to the east to its boundary with Burkina Faso in the north. French Togoland became Togo in 1960. The same family has been in power for five decades in Togo. Gnassingbé Eyadéma born Étienne Eyadéma, was the President of Togo for 38 years from 1967 until his death in 2005. At the time of his death, Eyadéma was the longest-serving head of state in Africa. On Sunday in February 2005, Parliament ratified Gnassingbe's ascension to his father’s presidency by changing the constitution to allow him to serve out his father's term, which was to have ended in 2008. Eyadéma son, Faure Essozimna Gnassingbé, has been the President of Togo since 2005. In June 2017, Gnassingbe was named the new chairperson of the Economic Community of West African States (ECOWAS). The current population of Togo is 7.7 million people made up of about Togo has 37 African tribes; the largest are Ewe, Mina, and Kabre. Cocoa, coffee, phosphate and cotton generate about 40 percent of export earnings with cotton being the most important cash crop.